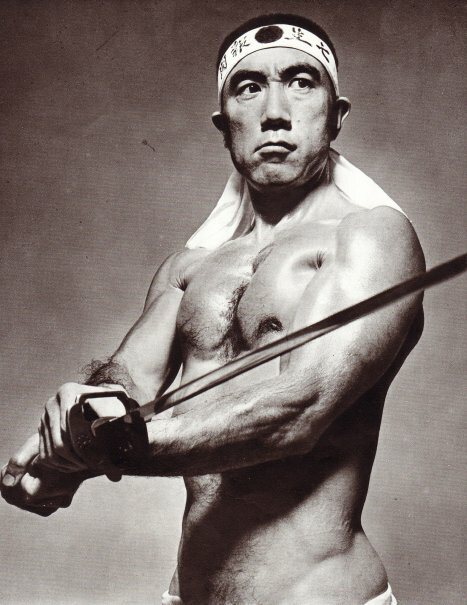 Yukio Mishima is how Japanese author and general creative type Kimitake Hiraoka (1925 -1970) is better known to the world. One of the most prominent Japanese literary figures of the twentieth century, he is primarily known for his writings and plays. He is also remembered for the manner in which he died. There are a lot of interesting elements to Mishima’s life, especially in regard to his masculine expression. Mishima’s early life is an interesting and perhaps telling blend of isolation and bullying. 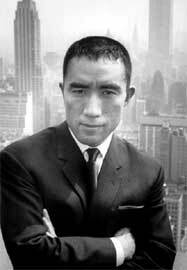 I am not going to write about Mishima’s extensive literary output which is rich in terms of expression of gender and masculinity & identity, but rather point out a few other things that I think demonstrate his masculinity and the complexity of it. Mishima’s sexuality is somewhat ambiguous, he was married and had children, but he also had homosexual relationships. He became interested in bodybuilding and martial arts and he articulated his relationship with his body in Sun and Steel. The above image is, I think, interesting in terms of embodied masculinity and particular post war Japanese masculine identity. As can perhaps be guessed from the above, Mishima was strongly nationalistic, to the extent that in 1968, a few years before his death he founded a nationalist militia, the Shield Society. This right-wing group was a short-lived one, disbanding after a failed coup, when a small group of members, led by Mishima, briefly seized control of the defence force headquarters and tried to rally the troops and restore imperial rule. After the failure of this, Mishima and one other member of the group, Masakatsu Morita, committed ritual suicide. These actions, the dedication and belief demonstrated by them, along with the extensive output of Mishima as an artist are fascinating to me. Rich in terms of a masculinity that seems amazingly passionate, disciplined and destructive. I don’t think it’s a good model of masculinity, but it sure is interesting from a historical and cultural perspective. Well, I’ve been a bit quiet here for a while. Other, non critical masculinities things have been demanding my attention a little more than usual. I’d like to post a poem today. I’m not usually big poetry person, not in so much as I don’t enjoy them, but more that they don’t crop up in my usual field of viewing and reading too often. I came across this one when reading Susan Bordo and while it isn’t about masculinity, I think it’s relevant and interesting to ideas around gender, masculinity & the body.